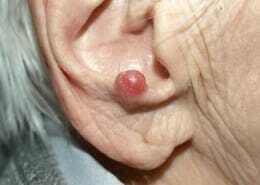 Very Rare and aggressive skin cancer of older people. 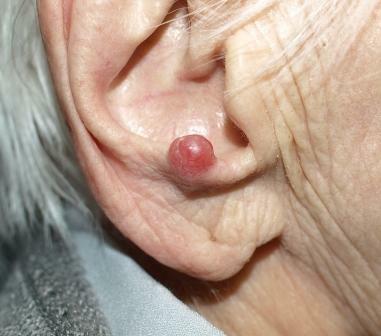 MCC is a rare form of skin cancer that is normally found in older people in sun exposed areas. Despite being rare, the condition is an important cause of skin cancer because of its aggression. Most cases are in people over 70 years, with only 5% of cases occurring in people under 50 years of age. There are 1.6 cases per 100,000 people in Queensland, and it is 2.5 times commoner in men then women. 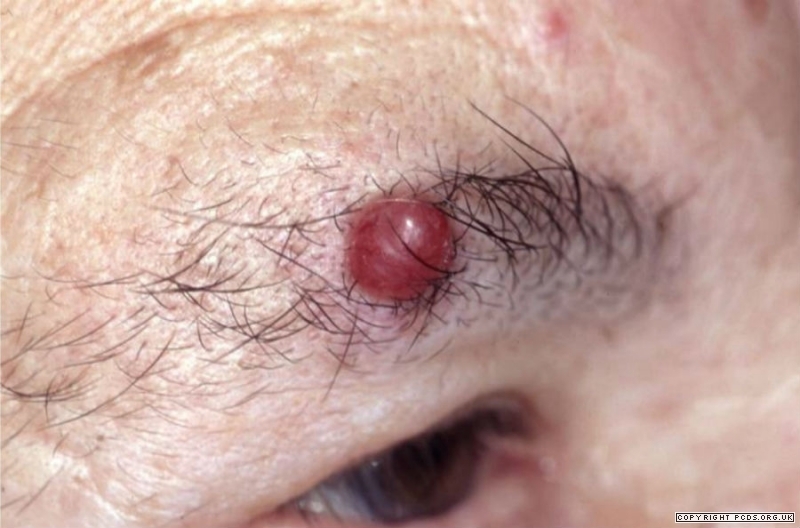 A typical presentation is with a rapidly growing, raised, red or reddish-purple nodule. However, the appearance of Merkel Cell carcinoma varies and it may be skin coloured. Half of cases occur on the head and neck, 40% on the limbs, and only 1 in 6 cases occur on non sun-exposed sites. MCC is rare and the appearance is not specific. The condition is not often thought to be a merkel’s carcinoma at the time of biopsy. Indeed, a cyst is probably the most commonly considered diagnosis. The diagnosis is made by the pathologist after a skin biopsy. MCC is made up of “merkel cells” which are blue in colour. Special Immunoperoxidase stains are used to confirm they are merkel cells. UV light is an important risk factor. The condition is more common in areas with a high UV index, and is usually found on sun-exposed areas. Immunosuppression is also an important risk factor for merkel’s carcinoma which helps to explain why the condition is most common over 80 years of age. There is also an association with advanced HIV, organ transplant or leukaemia. A skin cancer doctor may make the diagnosis. However, MCC requires treatment from a variety of specialists including a surgeon and oncologist. Treatment most often requires surgery with wide margins. The skin cancer often responds well to radiotherapy. The typical treatment is therefore surgery combined with radiotherapy. However, radiotherapy may be appropriate on its own when surgery is not indicated. It is most common in the elderly. The diagnosis is made by the pathologist based on a pathology examination of a skin lesion that has been removed. Merkel Cell – very rarely seen in the skin cancer clinic.